Not to miss out on the soundtrack promotion for The Legend of Zelda: Ocarina of Time 3D, gamers down under will also be able to register the 3DS title and get their hands on that special CD. The remake of Link's classic Nintendo 64 adventure is scheduled for release in Australia and New Zealand on 30th June. Club Nintendo members who register their copy of the game by 31st July will stand a chance of getting the official soundtrack. If you're still patiently waiting for the 30th, why not head over to our The Legend of Zelda: Ocarina of Time 3D review in case you missed it the first time around? Oh, it might make you want the game even more. Australasia collectively refers to Australia and its neighbouring countries (i.e. the Asia-Pacific region). @Xkhaoz3D - Every region pretty much is getting the soundtrack, or do you feel bad for not registering the game the first two days on the NA Club Nintendo? CD estimate shipping is July 5th for us. I can't wait to hear the great sounds over and over again! Awe man! They get that sweet ocarina AND the soundtrack. I is envious of you Australia....for once. Seems Australasia is an area within Oceania. Anyway, I'm jealous those Aussies are getting the awesome Ocarina. The only similar thing local to us is the Ocarina the French are getting, but they're fetching stupid money on eBay at the moment. Although I do like Oceania because it doesn't make NZ seem like part of Australia. It is NOT. In reference to the article, woop woop! At least you Americans have the game. As mentioned in the article it isn't out until the 30th. And I haven't got a 3DS yet BTW I don't think the ocarina is the best quality around and I don't know if I will be pre-ordering it. I'd say just go for it. It gives you a better chance of getting the free CD,plus the Ocarina could be a nice little thing to display. 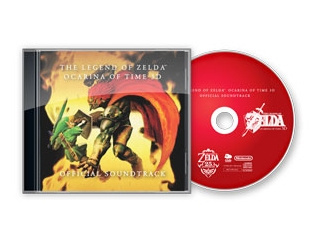 Ocarina replica and free soundtrack CD along with the game is a pretty nice deal. You can just get a 3DS when you have the money. There are some people that bought the game already, but don't got a 3DS. @Tri4ceHolder: you've got the greatest source of random information known to man at your fingertips. it would behoove you to use it. I always thought Oceania over Australasia. If I want it, I'll be sure to check eBay. Thanks for letting me know of it's existence, NL! @Qeuix: i'm sorry, i'm not seeing a typo...? Screw Australasia! Now how will I make fun of them!!! Okay, when do WE get that Ocarina? @lzbirdboy muhahahaha. All part of my evil plan. Of course no love for South Africa. You have customers here too Nintendo, maybe not as many, but it would be nice if just once we got something. Nice. Will have to remember to register it once I get it. This is a first! Australia has never got decent club Nintendo offers before, except for that classic SNES controler which cost 3000 stars and only stayed on the catalogue for a week. Luckily I managed to get one of them! Anyway, hopefully this trend will continue. I've always been envious of Europe's offers and those bookmarks, pencil cases, folders and Japanese fold fans really aren't worth my precious stars. Cool, congrats Aus...tral...asia... The exclusive ocarina officially makes all the past video gaming wrongs against you right! Enjoy it, now you are even with the rest of the world! @TheAmazingRaccoon: What is a patato? The number of users who have no idea what Australasia is truly frightens me. Before anyone posts more questions, Australasia is a region of Oceania, consisting of Australia, New Zealand, Papua New Guinea and some of the surrounding islands to the North. The difference is that Oceania extends from South-East Asia near Indonesia right through the entire Pacific Ocean to the Americas, including all the islands out on the ocean, such as Hawaii and Easter Island. but still not Norway? Any other way we can get it? So, there's no way for Club Nintendo US people to get it now?